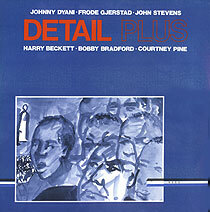 Johnny Dyani, bass, stones; Frode Gjerstad, tenor saxophone; John Stevens, drums; Bobby Bradford, cornet (Sides 3/4); Harry Beckett, trumpet (Sides 3/4); Courtney Pine, tenor saxophone, flute, bass clarinet (Sides 3/4). Sides 1/2 were recorded at the Hennie-Onstad Art Centre, Oslo on 2 March 1986; sides 3/4 were recorded at the Mannod Studio/Community Music, London on 1 July 1986. Original painting (front cover reproduced above) CANCAN by John Stevens.